In what appears to be the largest-ever joint protest by senior Israeli security personnel, a group of 106 retired generals, Mossad directors and national police commissioners has signed a letter to Prime Minister Benjamin Netanyahu urging him to “initiate a diplomatic process” based on a regional framework for peace with the Palestinians. He was referring to the Saudi-backed peace proposal that was adopted unanimously by the Arab League in 2002 (here is the full text) and later endorsed by the 57-member Organization of Islamic Cooperation, with Iran abstaining. It has since been repeatedly reaffirmed and its terms softened. As currently framed, it offers full peace, diplomatic recognition and “normal relations” between the Arab states and Israel in return for Israeli withdrawal to borders based on the pre-1967 armistice lines, with negotiated land swaps, and a “just” and mutually “agreed” compromise solution to the Palestinian refugee problem. The generals’ call echoes a proposal for a regional peace conference that was floated during the Gaza war this summer by Israel’s science minister, Yaakov Peri, a member of Yair Lapid’s Yesh Atid party and a former director of the Shin Bet security service. It’s currently being advocated within the security cabinet by Lapid and justice minister Tzipi Livni. 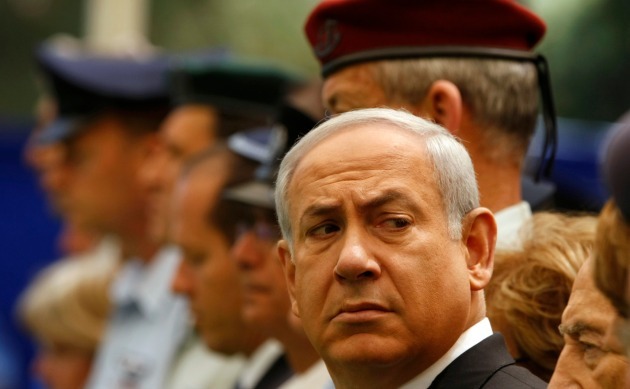 Netanyahu takes the position that Palestinian statehood at this juncture would imperil Israel’s security. Retired generals have occasionally made joint statements in the past, but never in such numbers and rarely on political matters that aren’t directly related to army business. In January 2012, 52 ex-generals signed a petition calling for legislation to require military or equivalent national service for Haredi men. In November 2011, 19 ex-generals called on IDF chief of staff Benny Gantz to combat growing religious extremism in the army. In February 2010, 15 ex-generals signed a statement criticizing “leftist organizations,” including the New Israel Fund, that they said had damaged the IDF by aiding the Goldstone Report. The generals’ letter apparently doesn’t refer directly to the Arab Peace Initiative (I haven’t seen the letter’s full text yet), but in calling for a regional process it appears to rely on the willingness of the Saudis and Egyptians to sponsor a conference leading to negotiated peace that renders “the Arab-Israeli conflict ended,” based on the initiative. The purpose of enlisting the neighboring Arab states is to give the Palestinian leadership backing and legitimacy to accept compromises it has failed to embrace on its own in bilateral talks. We, the undersigned, reserve IDF commanders and retired police officers, who have fought in Israel’s military campaigns, know first-hand of the heavy and painful price exacted by wars. This is not a question of left or right. What we have here is an alternative option for resolving the conflict that is not based solely on bilateral negotiations with the Palestinians, which have failed time and again… We expect a show of courageous initiative and leadership from you. Lead – and we will stand behind you.